A large house in the heart of Venice; a space that is open, unique, to inhabit, work and socialize in, a home to experience the most beautiful city in the world feeling Venetian for a few days. Casa Flora is an Italian-design apartment, completely custom made that welcomes travellers with the comforts of a boutique hotel but at the same time, the freedom of a private home. The project reflects the vision of two people from different worlds coming together: hotelier Gioele Romanelli and creative director Diego Paccagnella. 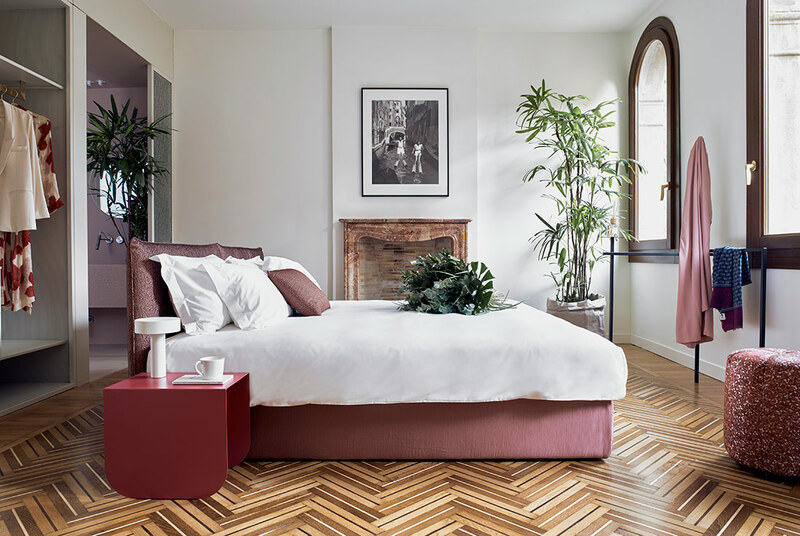 Romanelli, born and raised in Venice, is the heir of a hotel that has been in his family for three generations, and Paccagnella is a global entrepreneur and the founder of Design-Apart, a platform that connects artisanal furniture companies from Italy producing bespoke pieces with clients in New York City. The final outcome is a place that didn’t exist before in the lagoon, one that challenges traditional hospitality models and uses design to foster sustainable tourism. In Casa Flora, every piece of furniture is custom-made by Italian and local artisanal companies; more than 20 were involved in this project – and the entire design layout repurposes Venice’s imagery in contemporary forms. The house is divided into two parts: a flexible public space for social gatherings on one side and a private, more reserved on the other. The main entrance leads directly to the noble floor, which is also the social core of the house. A sort of domestic “campo” that can be used for dinners prepared in the adjacent kitchen by local chefs, or for work related meetings. Large windows allow the lagoon’s light to flood the space and three portals connect the different living environments, ensuring a fluid ensemble.On the other side, the private bedrooms are designed to enhance privacy and people’s well-being. The characteristic colours of the lagoon, such as light pink, green, yellow and blue are the same used for this intimate part of the house. Tapestry is nuanced accordingly and side tables morph into original flower vases. Each room includes a dedicated reading area and a SPA with hammam. The wide restroom space is thought as a small private garden, a relaxing greenhouse, a seamless extension of the garden in front of Casa Flora. The lavatories have two faucets: one functional and one filled with indoor plants allowing the house to breathe. Greenhouse-like fixtures are also used for the dividing walls between the bedroom and the restroom. Flora in Italian indicates the botanical world and natural design references are scattered throughout the whole project. Typical Venetian materials have been wisely repurposed in contemporary forms by architect Matteo Ghidoni from Salottobuono and Laura Sari, interior designer at Reveria. The lavatories are made of palladiana terrazzo tiles, a stone treatment technique usually used for flooring in the lagoon’s houses. The TM kitchen top repurposes a green stone that recalls the colour of the city’s canals but can also be spotted on facades of historic palazzi, churches and altars. Fabrics are from Rubelli, a Venetian based company that exports Venetian textiles all over the world. Murano glasses are from Salviati and the dining room table and bedroom’s doors are made of treated briar wood from Xilia, a local artisanal wood company. Everything that is on display at Casa Flora can be purchased online. Casa Flora proposes a selection of special design pieces crafted by the best Venetians and regional artisans who worked on this project in order to support the best local fabricators and make them accessible to travellers, in a contemporary fashion.